These cookies are easy and quick to make. I used whole wheat and oats for some fiber benefits and cinnamon for flavour, chocolate chips and nuts for crunchiness. Lab studies have found that honey and cinnamon include its ability to promote a stronger immune system, digestive system, increase the health of the heart, bones, skin, teeth, and hair, as well as stimulate weight loss. Oats reduce LDL cholesterol while helping to maintain levels of HDL and it is high in fiber. Making the switch to whole wheat flour will help you reap grains nutritional benefits without sacrificing some foods you love. Pre-heat the oven at 180deg c. line and grease the baking tray set aside. Cream together honey, vegetable fat, almond butter in a bowl with hand mixer or with an electric mixer. In a separated bowl whisk in wheat flour, oats, baking powder, baking soda, ground cinnamon, salt. Add these dry Ingredients to the wet mixture and stir to combine, stir in chocolate chips and dry nuts. Drop cookies by tablespoon full onto prepared cookie sheet. Bake for 10-12minutes or until the edges just start to turn golden brown. Centres will appear slightly undercooked. Allow to cool on cookie sheet for 5-10minutes before removing to a wire rack to cool completely. Store leftovers (If any J ) in an airtight container. You can even add peanut butter instead of almond butter. Posted on July 21, 2014, in Breakfast, Breakfast, Dessert, Indian, International, Kids recipes, Starters and tagged Chitras healthy kitchen, drchdietfood, Honey cookies, Oats cookies, prakruthi honey, prakruthi honey bangalore, Whole wheat cookies. Bookmark the permalink. 31 Comments. 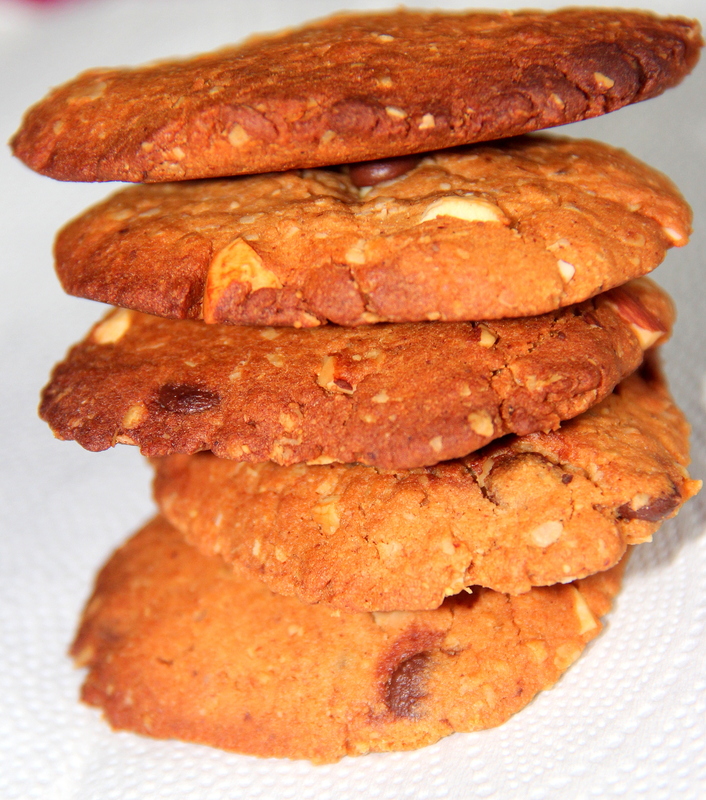 Nice cookies, honey is so good for you, it also reduces inflammation. Cinnamon helps lower blood sugar too. Thanks Vidya…It is one of the objectives set by my hubby for my recipes. It takes time to collate the info but feel good when you hear compliments from amazing people like you.. I have been thinking of something along these lines, myself. Awesome! Apsara – Nice…This was in draft for more than a month now.. This looks really yum. I’ve bookmarked it for later. Chitra – Why mix baking soda and powder? i am sure it is necessary it just tends to taste taint gluten free flours – or it does with my guinea pigs. But Rachel has taken this to share with her cooking group at the Day Care Centre. (I have modifed it as we can’t tolerate oats and just used soda and cows butter to get them to rise). We have also swapped honey for Agave Syrup as the only honey in the house is the credit-card screaming costly ones. Dear Mac- I keep questioning that to me all the time and tried to look on net but couldn’t gather much info on that. …as am new to baking even am not sure so please let me know if it is necessary to add both or just either one will do the job for baking. …thanx for sharing this and agave syrup is also a good choice. …I use both….look forward to hear from yourself. …cheers…. Dear Chitra The first answer I got was that soda allows the cookies to “brown” nicely. Another answer I got was that they lift the cookies at different times and use different chemical reactions. This is especially useful for wheat based flours. These look so delicious. Cant wait to try these at home. Emma. Thanx Emma for such sweet and encouraging words. …wait to hear from you. …. These look great! I love oatmeal raising cookies so I’m sure I would enjoy these.